Restaurant: Prakash Cafe's main restaurant serves primarily vegetarian, South Indian dishes for breakfast, lunch and dinner. We also serve assorted sweets and snacks including our famous gulab jamoons and butter masala dosas. Prakash Cafe has also introduced a vegetarian lunch menu served from 12:00 noon to 3:00 p.m. that has become hugely popular among local businesses in the community. Do you eat nothing but vegetarian dishes, come rain, sun or storm Not to worry! Enjoy scrumptious vegetarian delicacies at our pure vegetarian restaurant called Pari Purna. The Golden Metro – A contemporary restaurant named after the Karnataka’s ‘Golden Chariot’ Train – The Golden Metro is open from 12.00 hrs to 15.30 hrs and from 19.00 hrs to 23.00 hrs. 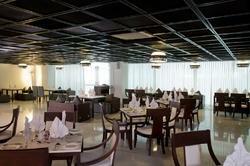 It offers global cuisine in a modern ambience. Jain Food is a speciality at The Golden Metro. 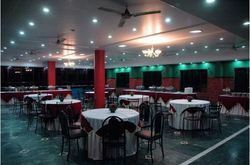 The menu offers an amazing selection from Indian, Chinese and Continental cuisines. Choose how you would like to enjoy your stay with a choice of lip smacking cuisine. However, each region is chock full of history, character, and unique cuisine. Since there are so many regional cooking styles, ingredients, and recipes, consider this an introduction. Yet, although cooking styles vary from region to region, spices play a huge role in all Indian and Chinese kitchens. PepperTree is our new multi-cuisine restaurant on the top floor of the hotel. The ambience is calm and serene with a great view of the Outer Ring Road and surrounding highrises. Indulge in a choice of Indian, Tandoor and Chinese. Crafted just for your palate and taste. Perfect for a family’s lunch out or a quiet discreet business dinner. Restaurant has an ambience that is unique, with birds chirping around and a breathtaking view of these marvelous hills. We offer various cuisines which include North Indian, South Indian and Chinese. We specialize in local cuisine originating from this particular region of Karnataka. A lounge that offers different kinds of cocktails, mocktails and liquors that you can indulge in.